Travertine is a very smart natural stone choice for floors, baths and showers, backsplashes, pool and hot tub surrounds, patios and walkways, and other applications. But have you ever wondered why more people don't choose travertine for their countertops? Here are the details. Popular countertop materials recommended by surpHaces include quartz, granite, soapstone, limestone, marble, laminate, solid surfacing, recycled glass, and butcher block. What do all of these materials have in common? They don't have holes. The voids in travertine are typically filled at the factory with Portland cement. These fillers do not hold up well to countertop activity, because they are prone to soiling and loosen or pop out with daily use. You generally won't find travertine filled with epoxy at the factory. Voids can be filled, a.k.a. "floated" with epoxy, which will hold up better than Portland cement. Floating and filler replacement, a service usually performed by a professional stone restoration contractor, can be time-consuming and therefore costly. 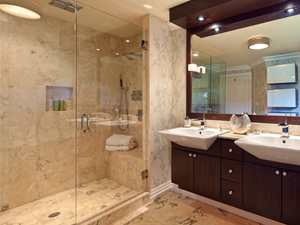 Maybe you are drawn to travertine because of the little fossils found in it. Did you know that you can also find fossils in limestone? Travertine and limestone are similar in appearance, but limestone is much better suited for use as a countertop material. Perhaps you can select a beautiful limestone slab instead of travertine.